The latest Samsung Galaxy Tab tablets are about to hit the market really soon, and now we have a general idea as to how much they will be priced at. Well, at least in Europe – a Dutch online retailer has all three of them listed on its web page, along with an estimated delivery date. So let's cut straight to the chase. 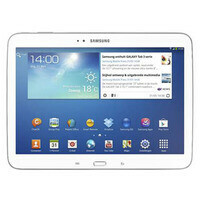 The Samsung Galaxy Tab 3 10.1-inch, which is the leader of the gang, carries a 379 euro price tag. That equals to a tad above $500. However, the retailer is running a promo (for a limited time, presumably) that slashes the tablet's price by 50 euro, thus bringing its cost down to a lot more reasonable $440. That gets you a 10.1-inch Android tablet of a mid-range class, with a 1.6GHz dual-core Intel processor, 1GB of RAM, 3.2MP main camera, and 16GB of storage. Moving further down the list we see the Samsung Galaxy Tab 3 8-inch priced at 299 euro, which is about $400. Sadly, there are no discounts with this one. Specs-wise, the tablet offers an 8-inch screen, 1.5GHz dual-core processor, 1.5GB of RAM, 5MP auto-focus camera, and 16GB of storage. Read more about it in our Samsung Galaxy Tab 3 8-inch review. Last but not least we have the Samsung Galaxy Tab 3 7-inch retailing for 199 euro, or about $266. That's a tempting price indeed, but you do get what you pay for. This low-end Android tablet has a 7-inch 1026 by 600 pixel display, dual-core 1.2GHz processor, 1GB of RAM, 3MP camera, and 8GB of storage. You can learn more about it by reading our Samsung Galaxy Tab 3 7-inch preview. Note that these prices are for the Wi-Fi-only versions of the Samsung Galaxy Tab 3 tablets. How much the 3G/4G-capable variants will cost isn't known at this time. All three devices are on pre-order with an estimated delivery date of July 11.